This past Sunday my pastor just started teaching on the book of 1 Peter. I couldn’t help but get excited about this book because of how much I relate to Peter, his impetuousness and his denial of the Lord. 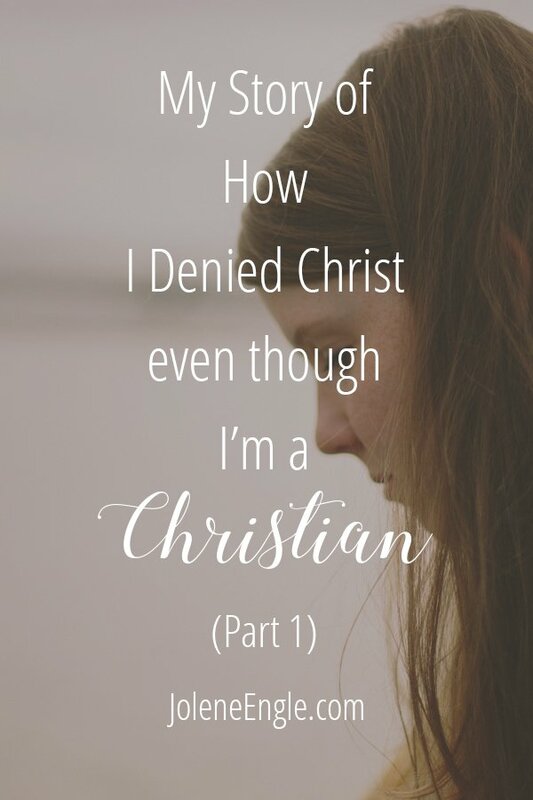 About 7 years ago I wrote my story of how I denied the Lord as a Christian. I thought I’d resurrect this post in hopes that it will minister to you. Have you ever experienced a time in your Christian walk when you just couldn’t sing songs of praise and worship to the Lord? Or a time when you just couldn’t, or you didn’t want to read your Bible? How about a time when you could not feel God’s presence in your life, and all you felt was darkness and despair? If you have, then you know that those are painful days where life feels hopeless. I am not a stranger to those days, either. I experienced a time like that as well, and that despair eventually led to my inward denial of Jesus Christ. I will never forget the time this brokenness occurred. It was right around the time of my spiritual birthday. I had been saved for 13 years. I felt mentally, emotionally, and spiritually different, but I couldn’t put my finger on what was wrong. I told my husband and my closest friend that I was ‘not right,’ but I did not know why. There were no new storms that were added to my life, just the ones we were currently living through that sent me into spiritual exhaustion and despair. For a couple of weeks, I was somewhat melancholy, and the perspective I had on life was a bit gloomy. With the new health treatment that I was on to keep cancer at bay, I assumed that my body was trying to adjust, so I figured I was just experiencing a mild case of depression due to my imbalanced hormones. Soon, I thought I would eventually bounce back to my normal self, but that was not the case. Eventually, I started to become bitter about serving the Lord, and I became callous towards reading my Bible, thinking, what was the point? I was sure I would read something that told me to die to myself and live for Christ, which is what I had been doing for so many years. Let me back up a little here in the story. On July 6, 1996, I gave my heart to the Lord, and at that time, I decided to fully follow Him with an intense passion. So, what did that look like, you might ask? My number one pursuit was to become a disciple of Christ. I wanted to know Jesus fully and truly have Him as the Lord of my life. I wanted more than fire insurance. I was not okay with just merely having Him as my Savior so I would not end up in hell. I desired the abundant life and the Living Water. One decision I made was to have Jesus Christ choose my husband because the Lord is much smarter than I am. Through God’s miraculous Hand, He blessed me with a man I do not deserve. I knew before I walked down that aisle on my wedding day that this was a man that I was going to purposefully respect and follow as best as I could, all the days of my life. I made the decision to learn to become a Proverbs 31 woman in my marriage and family. I was going to purposefully remain in Christ and abide in Him, in other words, I was going to seek Him with all my heart. I was going to diligently remain in God’s Word. I was going to faithfully attend church every week, along with attending Bible studies. I was going to serve Him with the spiritual gifts that He had given to me. When we were blessed to have children, I was going to raise them to be warriors for the Lord. I was going to teach them to use their life for Christ and build His kingdom. Bottom line: I was going after God, and my life was immersed in the things of the Lord. Who I wanted to become was a God-fearing, Christian woman, wife, and mother. That was my purpose in life, and that was what my life had become after 13 years. Now, back to 2009. So what happens to a woman who has pursued all those things for so many years and her faith in Christ is starting to fail, and she is now beginning to doubt and deny the existence of the Lord? Who was I and what did I believe in? I felt so lost. Was everything that I pursued a big, fat lie? Why didn’t God help me? After all, I was looking to pursue Him and Him alone. So, where was He in all of this? When I got saved, my trials started immediately, and I had continued living in the storms ever since. My life before Christ was never as painful as my life was with Christ, yet, of course, what I had with Christ was eternal life and without Him was eternal damnation. However, thirteen years of pain, heartache, long-suffering, afflictions, persecution, broken relationships, spiritual warfare, etc. I was done! I couldn’t take the pain anymore, and I was empty inside. I had no more to pour out and no more to give. I was becoming indifferent towards my relationship with the Lord. I did not care about pursuing Him, living for Him and abiding in Him. I felt that He had abandoned me at my deepest darkest hour and I was forsaken by Him as well. I, too, felt that same way. Many times I felt like God was on a vacation while I was crying and curled up in the fetal position. I went further down into the pit of darkness and I had no strength to continue on in my pursuit of following Jesus Christ. Before this dark time in my life, I had a deep faith in Christ. I believed with all my heart that He could move mountains and heal whomever He wanted, whenever He wanted. When you think that God is going to just miraculously fix the problem overnight and He doesn’t…what does any good, God-fearing, Christian do? They wait on the Lord and perhaps your problems will be fixed the next day or the next…and so what do you do? You wait, and wait, and wait. How much longer Lord must I endure these trials? I cry in anger when I don’t hear him and I groan in anguish. In the days and weeks during the months of June and July of 2009, my despair continued on and as the numbness inside my heart turned towards indifference, my husband realized that this situation was not normal. “Where is my wife?” and “I don’t know how to help you,”. I knew what he meant by those words. It was like I was a different person to him. Where was the woman who stood so strongly for the Lord with unwavering faith? Ironically, as I was struggling with my own spiritual issues, as a result of what I shared with my husband, I now became concerned for his walk with the Lord. Did what I have to say to him bring him to a place that may cause him despair as well? I felt bad for him because not only was he broken from all of our financial woes but now he had my spiritual issues to deal with as well. I did not know how to fix my problem either and I now wondered about what was going to happen to our marriage that was built on the Rock. In an instant, I became even angrier toward God. Where was He in all of this? I continued to go through the motions of my so-called Christian life with my family, because honestly, I did not know what else to do. I was still serving the Lord because my husband and I were the ones that started the ministry, so I wasn’t even able to take a break from that. I felt stuck and trapped, and inside I was dying. We still went to church on a weekly basis and I remember one Sunday morning I DID NOT WANT TO GO! I got in the car just like every other Sunday morning, but this particular Sunday was different. My beloved husband was asking me all sorts of questions about my relationship with the Lord and what was going through my mind. I had various emotions raging through me. I was angry, indifferent, bitter, callous, and I felt forsaken. I did not want to go to church and sing to a God who did not hear me when I cried to Him. I did not want to go to church and hear a message of hope when I felt despair. I did not want to go! Logically, I believed the Truth so I did not want to destroy the foundation that I was building for them, yet, in my heart, I was no longer trusting in Christ and believing in Him; denial of Him had taken root. He wasn’t in my life. He left me. So I walked into church and I just stood there during worship, not singing nor praising the Lord. That was the last thing I wanted to do. I turned my mind off to the message that was spoken that morning because I didn’t want to hear it. At the end of the message, I left the sanctuary (to run to the bathroom) as our Pastor was giving the closing prayer. When I came out of the bathroom, I could hear the last worship song being sung and I stood in the foyer of the church alone as I waited for my husband. I did not know her and wondered what she wanted from me. She asked if she could pray for me. I was stunned by her question but I responded with an awkward “sure”. Tears came down my face as I heard this prayer that came straight from God. Afterward, I said to her, “You obviously have the gift of intercessory prayer and I am sure you know that.” She said “yes”. I asked her how this prayer came about and then she told me the story about God’s hand. She was seated a few rows behind me in church. Like I said, I did not know her and I also happen to attend a very large church. Our sanctuary seats over 2,000 people. “Get on my knees?” Oh, Lord, you have never asked me to get on my knees before and pray for someone”, she said. “Get on your knees,” He said. Later, she told me she did not obey Him by getting on her knees. She did not want to have everyone looking at her, so she just prayed for me where she was. All throughout the church service, the Lord would prompt her to get on her knees and pray for me. When the service was ending and after our Pastor gave the closing prayer, she looked up from praying and saw that I was gone. Her spirit was grieved because she did not obey the Lord, but then as she walked out of the sanctuary she found me in the foyer. A complete stranger who was sent by God, knelt on the outdoor concrete as she lifted me up to the Lord. The healing and restoration of my faith began to take place through this stranger’s prayer. That morning, God showed me His love for me. He heard all of my cries and saw all of my pain and through all of this, His plan was to make me stronger so He could use me more. There was a purpose for all my pain and you can find out more in Part 2.